Spend a day exploring the Grand Canyon's Inner Gorge on a full-day excursion from Flagstaff—ideal for travelers of all ages and physical conditions. 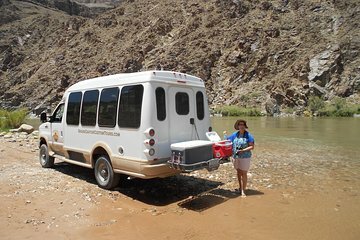 With this tour, save time searching for parking or waiting in the visitor center’s long lines, and journey 5,000 feet (1,524 meters) to the bottom of the canyon in an air-conditioned, off-road vehicle. This leaves just enough time for lunch at the river’s edge. This was a very long time in a van with very little time outside the van. We did see some cool wildlife which was the highlight of the trip.